Length X Width - 36" X 28.5"
How Good Is It For Hunting? 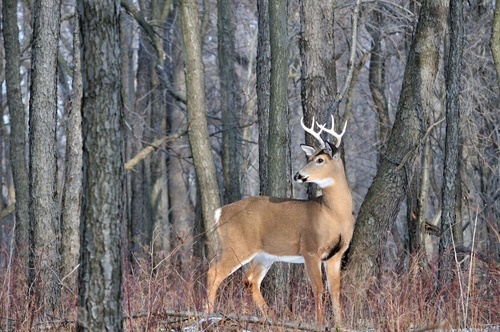 It is interesting to note that if you want to hunt big game like deer, minimum draw weight of 125 lbs is usually needed. As you can see, the Jackal specs more than satisfies that. The Jackal’s light-weight and compact size makes it very maneuverable in the woods. It is accurate and easy to aim. At 315 feet per second the Jackal crossbow delivers enough kinetic energy to take down the largest game in North America - including cape buffalo, elk, etc. If you didn't know, that is very impressive for this price range. How Does The Jackal Shoot? Watch the video below for a brief video on how well the Jackal crossbow shoots. Attach stock to quiver mount. Attach riser to the cocking stirrup. Secure the stock to the riser. Mount the 3-red dot scope. All of the tools needed to assemble are in the box - including keys, screws and bolts. How Accurate Is The Jackal Crossbow? I believe the Jackal may be the most accurate budget crossbow you can find. The scope is easy to sight. The Jackal performs well, taking not more that 6 - 12 shots before aligning with the scope. Beginners can easily achieve a 1" to 2" arrow group from 30 - 50 yards away. This means you can be a total newbie and be able to take down a rabbit at 30 to 50 yards away! Why is power stroke important? Usually, the longer the power stroke, the quicker the arrow will fly. The longer the stroke, the more energy and power is being transferred to the arrow. However, power stroke alone doesn't completely determine a crossbow's speed. There are several other factors that also influence speed. These include limb and cam design as well as draw weight. If you change the included field points to broadheads, you'll want to re-sight the scope once again. If you don't, your shot placement will be way off. Most broadheads come with practice tips, so if you buy broadheads, you'll be able to use them for target practice as well. Field points keep your target around longer, as using broad-heads will tend to destroy your targets pretty quickly. Upgrade the stock scope to Barnett's Cross Scope 4x32 Multi-Reticle. The scope has 3 vertical red or green LED's. Plus the bow comes with vertical/horizontal set screw adjustments, which can be used for three dot sighting-in alignment. For the price of this crossbow, I am impressed at how stable the weight distribution is. This is an important reason why the Jackal is so accurate. When it comes to accuracy, good weight distribution and stability are just as important as a good, calibrated scope. Our recommendation for the best broadheads are the Gamecrusher Broadheads. Click here to read about more of our recommended crossbow accessories. Note: Barnett has released a newer crossbow that has slightly better specs for a little bit more money. See current price of the Barnett Whitetail Hunter crossbow. Why Choose a Barnett Crossbow In The First Place? If you are at all interested in crossbows, you've probably heard of Barnett, a manufacturer of all things crossbow-related. Barnett has been in business since 1962, which demonstrates their experience and ability to know what hunters want. Barnett’s engineers are constantly outdoing themselves by making better and better crossbows - it seems to be a passion of theirs. They're always striving to make their crossbows better, faster, stronger and more powerful. Based on the changing demands of modern hunting, Barnett has streamlined their creations to be adjustable, lightweight and powerful. In general, a crossbow with a longer power stroke will house more energy than a heavier bow with a shorter stroke. The combination of draw weight, power stroke and high efficiency synthetic cam system will result in an even faster bolt speed. These things are what allows the Jackal crossbow to be surprisingly powerful. The Jackal crossbow, with a draw weight of 150 lbs, is very reasonable. If you're like most and are not interested in putting your fingers through strenuous work, or if you have arthritis, then we would recommend that you use a rope cocking device, which can easily be found on Amazon. This allows for a smooth and easy cocking of the crossbow. A good rope cocker can reduce the draw weight felt by the archer by about half. Not only that but it also helps your string to be even which allows you to make consistently accurate shots. Using a rope cocker, the Jackal crossbow could potentially be used by young adults and women as well. Wondering what the best crossbow case is for the Jackal? How about a Barnett crossbow case! They're inexpensive and get the job done. If you want to see more, read our article that covers a wide range of crossbow cases. If you're looking for more crossbow accessories, we've got an article for that too! How Good Are The Bolts? As noted above, the Jackal comes with three 20" Easton bolts. They each have screw-in field points. That is better than glued-in field points, which is prominent in cheaper arrows. The field points are 100 grains. They are also only intended for target practice and not hunting. The bolts seem to be very durable. Even after hundreds of shots, the arrows should not bend or break. But since the package only comes with three, we definitely recommend that you get more just in case. Although the bolts are 20 inches, Barnett also points out that 18 inch bolts should work just as fine. The Jackal comes with a tube of lube wax. When using the bow, make sure to wax your string often - about every 5 shots or so. This will ensure that you'll get the maximum life out of your string. Click here for more detailed crossbow maintenance tips. This lube wax should also be applied to the flight track every 5-10 shots. This keeps the flight track lubricated and reduces the resistance between the arrow and bow and keeps the bow from wearing out from the friction caused by the arrow. We strongly recommend maintaining the flight track well lubricated since it will also add to your crossbow's speed and accuracy, because isn't that what we all want? You may need to apply wax more often if your bow is exposed to heavy moisture. The crossbow has a military-styled body. The fore-grip is very comfortable to hold and it does a good job in keeping your fingers away from the flight rail. The shoulder rest is adequate enough, except that we would have liked it slightly wider. We really like the split limb design. It is practical because it allows the limbs to accelerate faster due to lowered air resistance, and it also adds to the bow’s aesthetics. The trigger action seems to be very solid and dependable. Some users report to really like the feel of it. We are definitely impressed with the high quality of the trigger considering this bow’s price range. The aluminum riser is light and should last for tens of thousands of shots. The split limbs allow it to be extra flexible and forgiving. The cable and string on the Jackal crossbow are made out of synthetic materials. Naturally, the string should start to fray and separate at about 700 shots. (unless you constantly make unforced errors such as accidentally dry-firing it) But after that you can easily replace them and continue to enjoy the crossbow. This Barnett Jackal crossbow review has touched on just about everything so far except safety. The anti-dry fire mechanism is fairly standard on crossbows today, so it's not surprising that the Jackal has one. If you don't know what this does, it prevents you from accidentally firing when there is no arrow attached to it. This is important to not hurt yourself accidentally, but it also prevents damage to the crossbow. Of course the Jackal also comes with a safety lock. You should find that the safety lock is easy to slide on and off when properly loaded. This is important if you're hunting or shooting with others. Let's say you're aiming at a deer and it begins to move. You begin to quietly follow and turn your crossbow away. If you're with friends, you wouldn't want the bow to accidentally fire. You can easily slide the safety on before lowering your aim, keeping you and your friends safe. We like the the fact that this crossbow has flared-out sides on the fore-grip. This protects your fingers by keeping them beneath the string. This is a great feature, because the string raking across your fingers could really do some damage. Remember the 315 feet per second speed of the arrows? Imagine that much kinetic energy hitting your fingers or hand. Ouch! We noticed that this crossbow doesn't take very long to master. You'll get bored shooting targets pretty soon and will want to get out there and hunt. It's important to note that this bow is ambidextrous. so you can also use it if you're left-handed. The crossbow is a bit noisier than most other crossbows, but, given its low price and the amount of power that it harnesses, it is to be expected. Now that I've covered just about everything you need to know in my Barnett Jackal crossbow review, I will share my verdict. Overall, I was very pleased with the Jackal crossbow on many levels. Its high power, accuracy, lightness and sturdiness make this a great crossbow for beginners. Advanced archers will enjoy this as well. With a rope cocker, this bow can be used by almost anyone who is old enough. It is highly accurate and can take down any wild game in North America. In my opinion, this is a great crossbow for the price and worth buying. Barnett offers a five-year limited warranty that covers manufacturer's defects in workmanship and materials. The warranty doesn't include normal wear and tear on the strings and cables, misuse, or dry firing. The velocity of crossbows is expressed in feet per second. The draw weight is the maximum amount of weight an archer will pull while drawing the bow. Then there is the power stroke. This is perhaps the least understood of a crossbow's features. Power stroke is the length between the crossbow's string in its farthest (or cocked) position and its resting (or un-cocked) position. To learn more about the basics of archery and crossbows, see our crossbow glossary. I found some online documentation from Barnett's website that will help you assemble your new crossbow. Follow the links below to access the PDF files direct from the manufacturer. If you have a question, be sure to leave a comment below.